Search Results for "antarctic peninsula"
Zooms to a beautiful snow covered mountain in Antarctica. A glacier meets the sea in Antarctica. Beautiful pan of mountains reflected in the waters of Paradise Harbor on the Antarctic Peninsula. Passing a large black rock in Antarctica. Passing a big tabular iceberg that has broken off from an ice shelf. Tourists in kayaks approach an expedition ship in Antarctica. Tilts up from small pieces of floating ice in Lemaire Channel. Zooms out from blue layers of ice in a tabular iceberg. Light behind icy hills foretells sunrise in Antarctica. Pans floating ice Paradise Harbor on the Antarctic Peninsula. Little chunks of ice show up on the water at dawn. Zooms in on passengers sightseeing in Antarctica from a cruise ship. Zooms in on an iceberg under a pink and blue evening sky. A snow etched mountain ridge in Antarctica. A big dark iceberg floats along in the early morning. Tilts down to reveal the reflection of a mountain in Paradise Harbor on the Antarctic Peninsula. Clear water reveals part of the underside of a small chunk of ice, probably the size of a growler. A view of brash ice or fragments of floating ice no more than two meters across seen in Paradise Harbor. Bright blue streaks appear near the base of a floating iceberg. Zooms in on a snow covered peak pink with alpine glow. 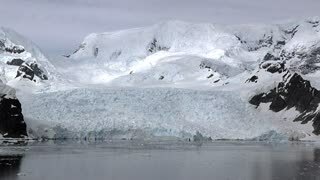 A time lapse view of the Antarctic coastline with icebergs floating by. Cruise ship passengers looking at a glacier in Admiralty Bay. Rippling water points toward a beautiful iceberg. Zooms out from sunrise in Antarctica. Zooms in on a snowy mountain under a blue sky on a sunny day in Antarctica. A beautiful view of a snow embellished rock on the margin of Paradise Harbor on the Antarctic Peninsula. A curious slide scarp exposing dark rocks appears in a glacier. Passing blue ice in a glacial tongue. Large numbers of penguins wander around on an Antarctic shore. An iceberg floats by a foggy coastline. Zooms out from a twilight view of an icy coastline. Kayaks with adventure tourists approach an expedition ship in Antarctica. A bird flies by passing icebergs in the blue light of late evening. Antarctic icebergs pass by under a pale peach sky. A large iceberg floats majestically by. Passing by ice along the shore of the Lemaire Channel. Zooms in toward an Antarctic cloud bank at dawn. Pans and zooms toward a sun rise in Antarctica. Cruise ship passengers crowd against a railing to admire a view in Antarctica. A view of distant penguins on a rocky shore. Passing snow shrouded mountains on King George Island in the South Shetland Islands. A floating iceberg stands out against a barely visible foggy coastline. Sailing past ice after the sun drops behind a cloud bank. An iceberg floats by in the twilight. Zooms to sunlight reflected on Antarctic water.